As usual the weather was not what I expected (it always rains when I go to Greece!!) However I still had a good holiday. The accommodation was cold and there was no heating but the manager provided extra blankets. The accommodation was, after I heard from others one of the better equipped; it even had a kettle, shower curtain and the positioning is good as most of the rooms get the sun in either the morning or afternoon. As I had two balconies I had sun both in the morning and the afternoon. The best restaurants were, in my opinion, Leonidas & Kalypso, both around the harbour. If you want to eat in a local Café try Dimitri's near the church - have the "Filet Dimitri" it's wonderful. Eating out should cost no more than 15Euros per person - without drinks. Spinalonga is a must!!! 8 Euros return ferry from the main square and 2Euros entry fee and it takes about an two hours to have a good look round. Another must is Knossos and Iraklion Museum - both filled Minoan treasures - although some of the restoration looks a little tacky. Whilst I was there they were repairing the road into the village so it can get a little bumpy. The beach is shingle and not sand and the whole town, I think, retains its character. If you are student please take NUS card or other form of official ID as this allows free entry into most museums and archaeological sites. Overall, a nice quiet resort that has not been spoilt by tourists. On arriving on the island the first thing that strikes you is the ease of getting through the airport, which is small by Greek standards and thus very easy to deal with. "Dimitri Studios" where I stayed was very basic and had I paid full price I would have asked to be moved to another apartment. The bathroom had no plug for the sink, there was no kettle, no toilet paper was provided and the door was extremely difficult to open! My veranda was actually under the next apartments window!! Lourdas is extremely hilly and if I were to go again I would definitely hire a car. The resort is also extremely quiet, in fact whilst there I only saw one bar. I went self-catering and although there are only two supermarkets these are adequate for everyday needs. Whilst there, I tried a few restaurants, Greco's (Good), River Island (OK) and La Mer. However, after I tried La Mer I went every evening. Not only is the food excellent try the "Lamb La Mer" & "Patata Bravas". But what makes this restaurant is the stunning views - absolutely wonderful at sunset sitting in the open air with views of the mountains and the bay below. The beaches are really clean and all have sun loungers etc for hire - however at 8 Euros a day they are not cheap. However, as mentioned before, please be aware that Lourdas is an extremely hilly resort and the walk from the beach can be very tiring. Although some of the studios do not have pools those that do have an 'open pool' policy and you can use them for free. The one that I found near my apartment was the "Elini Apartments" which had free sun loungers etc and a nice pool; they even provided the Lilos. Overall, a place that you go to completely unwind and relax; in fact although I wanted a quiet holiday it was slightly too quiet! This hotel could be so much more. The main problem is the views from the rooms. Only the ones at the front of the old hotel have any views; it is actually made up of six blocks. In fact most rooms overlook others and offer no privacy. Although the hotel brochure states that all rooms have balconies, they don't. In fact some rooms are so close to the next building that you can actually read the newspapers in the next house. As hotels go it is not the worst that I have been to I felt disappointed, as with a little more effort this hotel could be really nice. The entertainment: Very middle of the road and it appears to be geared toward the older age group, but to the hotels credit it is put on every night and was always packed. The food: Breakfasts are fine. However dinner is another matter. By day three I decided the best bet was to avoid all food prepared by the chef. So I only ate salads and food that was brought in and reheated. The rooms are fairly clean but sound travels and the rooms aren't that sound proof. So if you want peace and quiet get room away from the public areas. The pool area though is nice and gives good views over the hills. 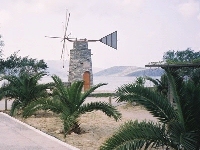 The resort itself, at this time of the year is extremely quiet, especially in the evening and Cala Millor; its neighbouring resort is quiet as well. However as the area is fairly flat I decided to higher a bike for a few days, which enabled me to get around and into the surrounding area. Son Servera, Arta and Cala Ratjada are well worth a visit. But a must see is the Caves of Drach. However do not do this trip with the tour company, as they charge 28 Euros for something you could do for just over 10 Euros on your own by catching the local bus. A must is Palma, I went, on the local bus that do appear when they should and are fairly comfortable and reasonably priced. The cathedral is wonderful and the side streets are great for shopping and wondering around. There are also loads of museums. The Museum of Contemporary art is well worth a visit. Overall, I would say that I enjoyed the holiday but purely because I got out of the resort, otherwise I would have been really bored. Would I go back? Yes, but later in the year. Would I stay at the Hotel Cala Bona? No. For the money I paid this hotel was adequate! I would say, however, that it is in the top three of the worse hotels that I have stayed in. There was nothing inherently dangerous about the hotel but for a three star hotel it was not up to the standard that I am used to. I would say that it is more like a one star. The main problem is that this hotel is essentially DIM. The corridors are dim and the rooms are dim. Unless you pay extra the views are non-existent. The first room I was given had a view of the wall. The second room was little better as I had a 'nice' view of the water pipes, however I could see the sea from my bathroom! The breakfasts were edible but had the worse selection I have had in hotels. It was just toast, rolls, cereal, meats and cheese. If you wanted eggs or a cooked breakfast you had to pay extra. The facilities are also very old. The games room consisted of a few video games. The bar was never open, the roof top pool & Jacuzzi were empty, the inside pool was so small you could swim from end to end in two strokes. It was also cold and unwelcoming and the furnishing looked very worn. The bed that they gave me kept banging the wall and as I discovered the base was actually woodchip. On the plus side the water was always hot and the room was serviced on six of the seven nights I was there. There was also a heater in the room. The resort itself is quite quiet but that has to do with the time of year and would say that in the height of summer it would be extremely busy. There are various restaurants that offer food but beware most offer the usual fare of chips and pizza; in fact the resort has been set up for the English. To travel round the island I used buses and they are very good value, if not a little old. I purchased a weekly ticket that cost LM6 (approx £10). Malta is a haven if you want history in bundles and I would recommend a day trip to Gozo and Comino. 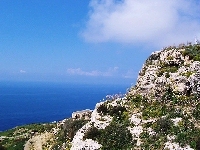 Go to Dingli Cliffs; the highest point on Malta. The local food is excellent and all freshly produced. You should try Bragioli (rabbit stew) and for quick but calorie-loaded snacks you must try pastzizis - very cheap and very nice. If you are looking for a very basic hotel with no frills and with nothing going for it then stay here otherwise look elsewhere. Valletta is wonderful with absolutely loads to see and do for those who like history. It is also 'chic' but in a nice rundown sort of way and is extremely pleasant. Everything you need to see is within walking distance and I loved it. Sleima - very modern with loads of high-rise and quite a few building sites but worth visit just to feel the place. Overall I felt really relaxed when I left Malta, there is something about the place that I liked even though the hotel was not upto my usual standard. Go to Malta, enjoy! What I will always remember was this written on a restaurant menu "If you have a complaint please tell your waiter. If you have enjoyed your meal please tell your fiends" No it's not a spelling error! I had previously had a bad holiday on another of the Greek islands and as this was a late booking with accommodation allocated on arrival it was with some trepidation that I went on this holiday!!! However I needn't have worried. The island is wonderful, laid back and has not yet been spoilt by tourism. The restaurants are all excellent value for money; and the only bad meal I had was in the "Old Port" restaurant. Others also complained whilst I was there. The best restaurants I found were "Vinerias" & "Syrtaki's"; both right on the beach just past the old harbour. Overall a totally laid back place and one for those romantics out there!!!!! As holiday hotels go the Miramar Golf is decidedly average. The food is OK but there is not much of a selection of local foods on offer. If you get a north facing room ask to be moved as they are cold and the heating isn't that good! The hotel is about a 15 minute walk from the resort itself and if allocated a room overlooking the pool beware that they are north and east facing and thus do not get much sun. The best way to get about is by local taxis into Sousse and then the Metro or train. Although I don't normally partake in organised trips the "Sahara Explorer" is good value although there is a lot of travel involved. Finally, if you go to Tunisia at this time of year do not expect hot weather; the weather is pleasant but it can rain and be chilly in the evenings.